Our cross and the Cross of Christ. Throughout the Sundays of the Great Lent and its preparatory period, the Church teaches us the different aspects of Orthodoxy which we must incorporate into our lives, in order for the Triumph of Orthodoxy to take place not only in a historical sense, but also in the life of each one of us personally. Thus, for example, the Church teaches us humility (Sunday of the Publican and the Pharisee), repentance (Sunday of the Prodigal Son), the fear of God (Sunday of the Last Judgment), inner prayer, which is the highest form of communion with God (the 2nd Sunday of Lent). 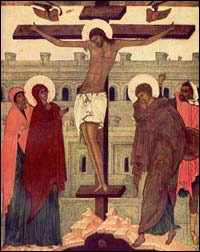 The 3rd Sunday of the Great Lent is dedicated to yet another very important aspect of Orthodoxy in our lives - the bearing of one’s cross. And, as the supreme example of the bearing of one’s cross - the Cross of our Saviour lies before us that entire week. Why is it so important and so necessary for each Orthodox Christian to carry in his life a cross - that is, the totality of sorrows and suffering which Divine Providence sends to each one of us? The answer is quite simple: because without a personal cross there is no personal salvation, just as without the Lord’s Cross, without His crucifixion and suffering there would be no salvation for mankind. By carrying His Cross, our Lord Jesus Christ opened the gates of paradise to us, while each one of us must carry his or her own cross in order to enter these gates. After our forebears, Adam and Eve, fell into sin and were expelled from paradise, the earth became a vale of tears and suffering. Thus, living on earth in exile, we must well remember that there is no happiness on earth, and that all futile attempts by philosophers, thinkers, sociologists and other human minds to find happiness on earth have been simply a pursuit of a mirage. Happiness can be found only in the Heavenly Kingdom, where there is eternal rapture. On earth we see only glimmers of happiness, which show us what we have lost and what we must seek. For example, we find happiness in charity, when the divine trait of mercy fills our soul with joy. We find happiness in friendship, when the divine trait of love joins our soul with the souls of others. We find happiness in marriage, when our church union follows the example of the union of Christ and His Church. Finally, we find happiness in communion with God through prayer, church services and the sacraments. But all these feelings of happiness and joy are only shadows of true happiness in heaven. Eons ago this true happiness was directly given to Adam and Eve, but they lost it, and now we, their descendants, must earn this happiness by bearing our personal cross. However, we must remember that it is not enough just to carry our cross, i.e. endure the sorrows and suffering that are sent to us. Bishop Ignaty Bryanchaninov tells us that simply bearing a cross does not yet make it a means of salvation for us. Our personal cross helps us attain salvation only when we turn our cross into the cross of Christ. And how do we do that? The answer is again simple: we must bear our cross in the same manner in which Christ bore His. Let us consider the distinguishing characteristics of the Cross of Christ, and let us try to incorporate them into our own life, into our own cross. First of all, there is complete obedience to the will of God. Our Lord Jesus Christ, being God, could have saved us in any other way, but the will of God chose that which was the most horrifying in human sin, the most tormentful and cruel, in order to expiate sin completely, and the Son of God showed absolute obedience to His Father, again in order to fully expiate the disobedience of our forefathers and their violation of God’s will. Thus we, too, must obediently accept all the sorrows which God sends us, and must firmly believe that it is these very sorrows, and none other, which will lead us into the Heavenly Realm. Secondly, the Lord Jesus Christ exhibited absolute patience. He suffered terribly and at great length, yet He expressly drank to the last bitter drop the full cup of torment, and endured it patiently and meekly. So should we bear our sorrows patiently and meekly, in the belief that the Lord will never give us more than we can bear. And if we thus endure, we will even witness a miracle within ourselves: just as the Lord invisibly gave strength to the martyrs, who could never have been able to suffer on their own the great torments to which they were subjected, so will the Lord, seeing our effort, give strength to us and will even lighten our cross considerably, in accordance with His Own words: for my yoke is easy and My burden is light. And thirdly, the Lord bore His cross with joy: joy at seeing the ancient enemy - Satan - being vanquished; joy at seeing mankind liberated from captivity; joy at seeing man - the crown of God’s creation - once again entering the place of bliss that had been prepared for him. Let us, too, each one of us, carry his cross with joy: joy because in this cross is revealed God’s love for us; joy because this cross affiliates us to God; joy because this cross opens for us the way into paradise. And we glorify Thy holy Resurrection!